Let’s face it, the news on the economy is bleak. Every day we hear about job cuts and poorer-than-expected earnings that continue to mount in the tech and digital media spaces. Panasonic was the latest electronics manufacturer forced to downwardly revise its full-year earnings outlook, now projecting a net loss of 380 billion yen or $4.2 billion for the year ending March 31. This world’s leading maker of plasma televisions will cut 15,000 jobs. TimeWarner reported a $16 billion Q4 loss due to a more than $24 billion in write-downs at its cable, publishing and AOL divisions, despite an 8.7% increase in revenue. The company said it will lay off 1,250 additional workers this month. Push has come to shove in terms of making a decision regarding the future of AOL, revenue at which dropped to $968 million from $1.25 billion, despite higher page views and greater usage. During the company’s earnings call, CEO Jeff Bewkes claimed that Google is demanding that it either spin off AOL as separate entity or buy Google’s 5% stake in the company at fair market value. Google was forced to write down its $1 billion investment in AOL by nearly $750 million. That’s just in today’s news. But for all that does not put a smile on anyone’s face, there are many tales of survival out there, such as the story of Vanessa Cooreman Smith, who dreamed of running her own boutique since college, and she’s not letting anything — not even the dismal economy — stop her. Smith, 27, and her husband are selling their spacious, two-story, lakefront home in South Bend, Indiana, to keep her business alive.”We learned to live on less,” she tells reporters. The couple, along with their 3-year-old son, plan to move to a smaller home, one of many cuts they have made to make ends meet. The family will cut their mortgage in half. “It’s worth every sacrifice we’ve had to make,” says her husband, Steve Smith, 26, a self-employed Realtor. As companies continue to lay off tens of thousands of employees each day, the Smiths aren’t worried about getting a pink slip. But running their own businesses brings no less anxiety – yet they are surviving, and finding creative ways to do it. Online Content: The New TV? They say that Hollywood is recession proof, but is it depression proof? And what about TV and the decline in ad sales and revenue? The real question is: will TV survive as more and more content goes to the web? And it’s online where content is flourishing and profitable. That the case of Zune, Microsoft’s answer to the iPod that offers downloadable music on a monthly subscription basis, is adding an original content production division to create free add-supported videos programming for its users. Zune will develop pilots over the next 12 months ranging from live-action and animated comedy to urban and music programming. Its first project will be Cinemash, a joint 8-episode production with arts and entertainment magazine Mean featuring famous actors reinventing classic scenes in movies they weren’t in. Previous shorts produced for MeanMag.net have featured stars such as James McAvoy, Elizabeth Banks, Kate Beckinsale, Sir Ben Kingsley and Seth Rogen and have racked up over 1 million views worldwide. YouTube and the William Morris Agency have signed a production deal that would put a number of the agency’s A-listers to work on original made-for-the-web productions on the platform. Other top agencies including UTA, which launched its own web division UTA Online more than two years ago, have been eager to stake their claim in the new media world in the hopes of discovering rising stars and providing ins for their more established stars. But a direct partnership between YouTube and the agency that represents Denzel Washington, J.J. Abrams and Michael Bay could signal a major commitment in developing high-profile, major budget fare for the world’s dominant web video platform. Techie-centric web video producer Revison3, creators of shows like Diggnation and Tekzilla, had some buoyant annual usage numbers to share. Views of Revision3 programs increased by more than 140% in 2008 to 46 million overall views — translating into nearly one billion minutes of engagement for sponsors. “It’s the engagement numbers that are most compelling for advertisers,” says CEO Jim Louderback. “Our product integration deals (like the one with Anheuser-Busch that supplies Diggnation hosts Alex and Kevin will all the beer they can drink) allow our audience to go deep around brands, creating a connection that can be very valuable for advertisers.” Revison3 also sells midroll and post-roll ads but product integration has become the real breadwinner, commanding $80 CPMs that are rarely discounted. The company is reaching viewers on a variety of platforms; about 30% watch on Revision3.com, another 30%-40% get their regular fix via subscriptions on iTunes and other RSS-based syndication services and the remaining 20%-30% watch on YouTube, TivoCast and CNET. Transpera also manages mobile distribution for Revision3 shows, including distributing podcasts via the iPhone. The company is hoping to increase its subscriber base further this year via web search optimization strategies. A new partnership with a vendor called EveryZing increases the chances of Revision3 shows coming up in search engine queries by converting dialogue from each show into text then tagging key words and phrases. Google’s recent move to integrate video search with text pulls up thumbnails of videos with each search. Such news puts smiles on our faces when facing bad economy news. But you don’t have to be an A-list star with William Morris repping you to find your own face online and in content. The number of amateur creators contributing to the user generated content phenomenon reached 83 million in the U.S. last year, according to eMarketer. That number will continue to increase over the next five years as internet users become more eager to contribute to the conversation, surpassing 108 million creators or 50% of the internet audience by 2012. Google Sites once again ranked as the top video property in the U.S. with 5.9 billion videos viewed (a 41% online video market share), with YouTube accounting for more than 99% of all of its videos viewed, according to ComScore’s latest Video Metrix report. Fox Interactive Media ranked second with 445 million videos (3.1%), followed by Yahoo! Sites with 330 million (2.3%) and Viacom Digital with 291 million (2.0 percent). Hulu continued its impressive growth trajectory, climbing 6% versus November to 241 million videos viewed. Nearly 150 million U.S. Internet users watched an average of 96 videos per viewer in December. Google Sites surpassed 100 million online video viewers during the month, representing two out of every three Internet users who watched video. Previous PostThe New Online Payola -- Good or Bad? 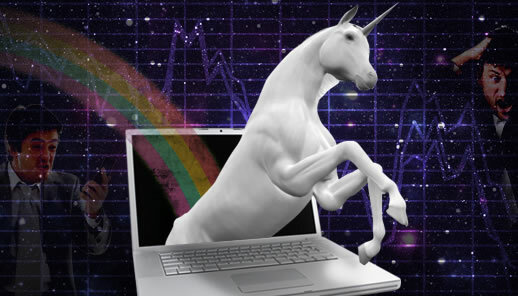 wait, so are you saying that if i buy a mac notebook, i get a unicorn?